This animation depicts ground subsidence resulting from the extraction of oil. The oil fields are located near the community of Lost Hills, California, approximately 100 km northwest of Bakersfield. 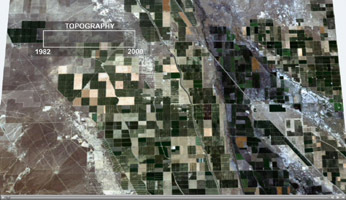 This animation depicts the changes in ground elevation between 1982 and 2000. The 1982 topography was described by a USGS map, and the 2000 topography was measured during NASA's Shuttle Radar Topography Mapping (SRTM) mission. Over the 18-year period bracketed by topographic data sets the maximum subsidence was approximately 3 meters. Changes in elevation have been exaggerated by 300% to aid in the visualization of subtle changes in the elevation. From a vantage point above the center of the study area we fly to the Belridge Oil Field and cycle between the topography of 1982 and 2000. We then fly to the Lost Hills Oil Field and repeat the cycle of topographic change. Finally, we return to the original vantage point above the study area. Data and analysis courtesy of Robert Crippen of the Jet Propulsion Laboratory. For more information regarding this animation, please contact Robert Crippen or Vincent Realmuto, Jet Propulsion Laboratory.